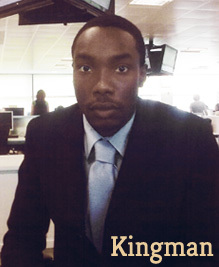 Kingman is a Reggae Singer & Songwriter. Kingman was born in the United Kingdom. Kingman is of Caribbean and West African parentage. Kingman has two younger sisters. Kingman has a passion for reggae music. He has been a fan for a long time. His favourite reggae artists are Bob Marley, Shabba Ranks, Junior Reid, Capleton, Sizzla, Beenie Man, Delly Ranks, Luciano and many other artists. He has attended several big reggae concerts, as a patron to see big reggae artists like as Junior Reid, Sizzla, Morgan Heritage, Junior Kelly, Capleton and many more. His passion for reggae music developed when he was student in the University. Kingman has always liked to write his own songs. He was a member of the African Caribbean Society. He performed his own song at the Annual African Caribbean Society Party. It was at this event his friends noticed his talent for singing. He has performed at several events since then. Kingman is a great lover of reggae music and is still a big fan. In his view, 'reggae music is the music of love, the music of hope and the music of positive messages for all people especially black people'. Kingman loves to practice his singing skills as much as possible. He is very aware that the music industry is quite tough. In Kingman’s view 'if you are a reggae singer/artiste and do not live in Jamaica you have to work a lot harder to be recognised worldwide'. Kingman has released a number of singles. You can download his debut album King In Town which can be purchased at this site under the Music Store section. Kingman is a humble and respectful person.